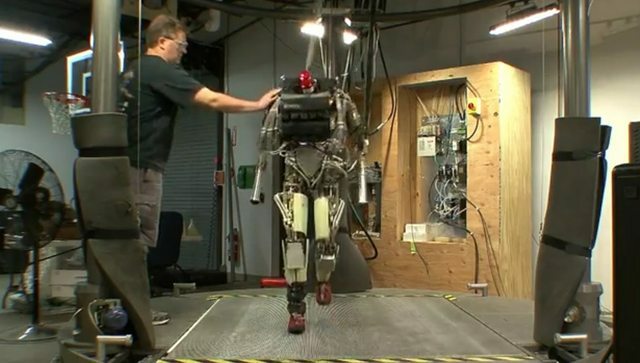 This video shows versions of DARPA and Boston Dynamics robots climbing stairs (wearing shoes), walking on a treadmill and doing pushups. I is interesting to see how it climbs the stairs with the help of one arm. Boston Dynamics developed the PETMAN Robot and is now adapting it for use by the DARPA Maximum Mobility and Manipulation (M3). A modified platform resembling these robots is expected to be used as government-funded equipment (GFE) for performers in Tracks B and C of the DARPA Robotics Challenge. The GFE Platform is expected to have two arms, two legs, a torso and a head, and will be physically capable of performing all of the tasks required for the disaster response scenarios scheduled in the Challenge.